What is a Moon Mother, and what is Womb Blessing training? What is a Moon Mother? A Moon Mother is a woman who has trained with Miranda Gray to give the Womb Blessing to a woman in person, and to take an active part with Miranda in sending the Womb Blessing energy in each Worldwide Womb Blessing event. Moon Mothers also participate in sending the Womb Blessing energy to all the women of the world over the three days of each Full Moon between the Worldwide Womb Blessings in the Moon Mother Blessing. Being a Moon Mother is a beautiful and inspiring path of self-development, spiritual development, devotion and service. Moon Mothers are women who have answered the call in their hearts to spread the Womb Blessing to other women to help them to awaken their femininity, to heal, and to express their natural female spirituality. They are often pioneers in places where women are deeply disconnected from their female energies, and each Moon Mother uses her own enthusiasm, passion, creativity, experiences, knowledge and intuition to guide her on how she works with women and the Womb Blessing. 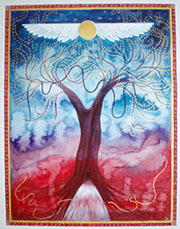 Moon Mothers can be healers and therapists, coaches and teachers, priestesses and celebrants, midwives and Doulas, medical professionals, women’s group and circle facilitators, Red Tent organisers, and women who simply answer the call in their heart to support women and to help them to open to their natural femininity and female spirituality. There are NO REQUIREMENTS to become a Moon Mother. It is not necessary to have energy-working or healing experience or to have worked with women or women’s groups before. The youngest Moon mother is 22 years old and the eldest Moon Mother is 80 years old! What does a Moon Mother do? A Personal Womb Blessing is focused on a woman’s femininity, helping her to connect to her female energies and nature, raising her vibration and bringing conscious awareness of the Divine Feminine, and awakening aspects of her four female archetypes that have be repressed or that are dormant. The four female archetypes consist of the Maiden, the Mother, the Enchantress and the Crone, and they are associated with the energies and experiences of the four phases of the menstrual cycle and with the four phases of the Moon. These archetypes are patterns and energies that are inherent in our female nature regardless of culture, language, religion and society. They are the ‘authentic female nature’ of women. The Womb Blessing focuses on awakening all aspects of these archetypes into our awareness so that we can accept them, love them and joyfully express them in our lives in female conscious living. A Personal Womb Blessing consists of a sequence of hand positions and breaths, with the receiver sitting fully clothed, and usually lasts approximately 30 -45 minutes. The Womb Blessing can be given alongside other therapies or combined with the ‘Womb support healing’ and with Womb Blessing mentoring. Originally designed to help women integrate the changes of the Womb Blessing into their lives, this beautiful healing has become a therapy in its own right. The Womb Support Healing is a gentle and relaxing hands-on healing sequence that works with the three main female energy centres (different to the chakra system) and the energy points that relate to the four female archetypes. The Womb Support Healing supports the changes the Blessing energy creates, clears energy blocks and restores the energy of the womb centre and of depleted archetypal energies to bring balance across the menstrual cycle and between archetypes – this is particularly helpful for menopausal women. Womb support healing can be given before a Womb Blessing to prepare a woman for the Blessing, or after the Blessing to help her to integrate the Womb Blessing changes. It can be given to a woman as often as she wishes, and is often described as an oasis of female calm and restoration in a hectic and busy modern world. In May 2012 the first Moon Mothers took part in the Worldwide Womb Blessing, and the effect was amazing - the beautiful energy of the Blessing increased out of proportion to the number of Moon Mothers taking part! The Worldwide Womb Blessing is a way for Moon Mothers to send the Blessing to women they cannot meet personally, via a technique specific to the Worldwide Womb Blessing. Moon Mothers can both give and receive on Womb blessing day, and the amount of energy that they send and receive increases and expands their own personal healing and spiritual development. Moon Mothers can send the Blessing energy at all four times during Blessing day if they wish, and many Moon Mothers meet together to send the energy. In December 2013 thirty Moon Mothers met with Miranda in person in Mexico to send the Blessing energy from a beautiful cenote – a large hole in the white limestone rock filled with water. The experience was amazing and very profound, as the island the Moon mothers were working on was in the shape of a turtle, a symbol of the Earth mother and the abundant creative energies of femininity. There will be more opportunities for Moon Mothers to take part in the worldwide Womb Blessing in person with Miranda. 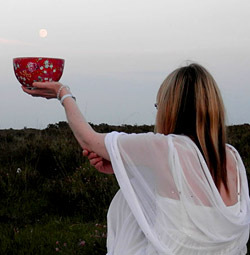 Taking part in the Moon Mother Full Moon Blessing is a little like striking a Tibetan Singing Bowl and stroking the bowl to keep the vibration of the note singing. The Worldwide Womb Blessing is where Moon Mothers create the vibration of the Womb Blessing in the World, and the Full Moon meditations between worldwide events is the Moon Mothers keeping the vibration of the Womb Blessing energy singing around the Earth. This Blessing is only given by Moon Mothers, and many meet together each month to send the energy of the Blessing to all the women of the world to bring love, support and comfort, especially to those in pain and who are suffering. Any woman can run a worldwide Womb blessing group, but a Moon mother acts as a catalyst in the group increasing the amount of energy women receive and deepening their experience and healing. The Moon Mother doesn’t have to facilitate the meditation, simply being in the room is enough. Many Moon Mothers run Worldwide Womb Blessing groups as part of their path of spreading the Womb blessing energy. Once women have experienced the Blessing energy they often want more, and Moon Mothers can offer both Personal Womb Blessings and Womb support healings on Blessing Day. Moon Mothers who teach workshops for women or who run women’s groups may include the Womb Blessing within their workshops. The Worldwide Womb Blessing is an organisation based on volunteer help and support, and it runs a ‘buddy’ system. The Moon Mothers look after the women in their area. Moon Mother Representatives look after the Moon Mothers and women in their area, and Country Administrators and their Womb Blessing Teams look after everyone. Miranda and her Womb Blessing team try to look after everyone worldwide but it is a huge job! Moon Mothers can volunteer to become one of the Representatives for their area. This involves running a regular Worldwide Womb Blessing group, being a point of contact for questions, helping women to find or start their own groups, and support their Administrator and her team. In large cities and towns there can be as many as ten Representatives for different areas. Moon Mother Representatives are also very important for feeding back ideas, comments and suggestions to Miranda to help create a better organisation for women in every country. In some countries Administrators send out newsletters to their Moon Mothers and many Representatives run Womb Blessing Facebook pages. Other Moon Mothers also help support the Womb Blessing Ning Community, which has multi-language Moon Mother-only groups and work on spreading the invitation to take part in the Worldwide Womb Blessing through social media, blogs and talks. The Womb Blessing training takes place over two days and is a blend of practical energy work and information, given in a caring and loving female sanctuary. Workshops are currently available in Europe, North America, Central America and South America, with plans for workshops in other areas of the world. All workshops are delivered in English by Miranda Gray with translation into the local language, and all support materials are translated. > Find a Womb Blessing workshop near you! The training starts with an introduction to the development of the Womb Blessing. The main part of the first day is the Moon Mother initiation, a ceremony that awakens the student’s energy centres and raises her vibration to the level of Moon Mother through the love and presence of the Divine Feminine energy. Each Moon Mother is given a bracelet as a symbol of the ceremony and of her new path of being a Moon Mother. In the afternoon the new Moon Mothers are taught to give the Womb Blessing and there is plenty of practice led by Miranda. Moon Mothers are also guided through the process of integration, practical aspects of giving a Blessing – ranging from ‘How long does it take?’ to ‘Can we give it to men?’ - and also the energy structure and process behind the Womb Blessing Meditation. Moon Mothers are taught additional techniques to enable them to hold more energy. They take part in giving a complete Womb Blessing and also receive a full Womb Blessing. In the afternoon Moon Mothers are taught about the energy structure behind the Womb Support Healing and have the opportunity to both practise and receive a healing. Finally Moon Mothers are taught how to send energy in the Worldwide Womb Blessings, given more in-depth information about the worldwide events, introduced to the Full Moon Blessing and website support, and are taught how to give a Cauldron Energiser. Each day opens the students up more fully to being a vessel for the Womb Blessing energy, builds confidence in giving the Blessing, and offers a safe feminine environment for women to share their experiences and feelings. Each Moon Mother has her practitioner name, email and town and country published on the Womb Blessing website > list of authorised Moon Mothers. They are also invited to the Moon Mother groups in the Ning Womb Blessing Community based on country and language of their choice, and receive a manual and passwords to an online Moon Mother login area to download additional materials and find extra resources. Moon Mothers are supported by their workshop organiser, local Representatives and Country Administrator, as well as online through Moon Mother communities in different languages. The Moon Mothers are a sisterhood of passionate and loving women from many different backgrounds who come together to support and love each other. Many Moon Mothers contact other Moon Mothers when travelling to other countries to build new friendships. If you feel the call in your heart to become a Moon Mother, take the first step!